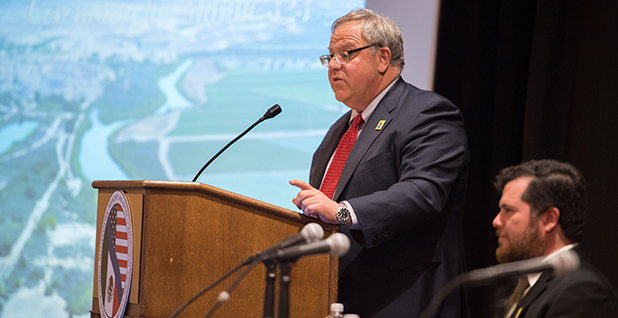 Acting Interior Secretary David Bernhardt must soon decide whether to maintain eight temporary agency directors, as the Trump administration presses into its third year without appointees for a slew of top posts at the department. According to Secretarial Order 3345, eight temporary appointments — including the heads of the Fish and Wildlife Service, Bureau of Land Management and National Park Service — will expire on Jan. 31. The latest version of that order, signed by former Interior Secretary Ryan Zinke in mid-November 2018, also names individuals to take on the duties of the solicitor; assistant secretary for policy, management and budget; assistant secretary for fish and wildlife and parks; special trustee for American Indians; and director of the Office of Surface Mining Reclamation and Enforcement. An Interior Department spokeswoman declined to comment on whether Bernhardt will issue a new order, citing the funding lapse that has shuttered the agency since late December. Environmental advocacy groups have disparaged the White House over its failure to put forth nominees and asserted that the Trump administration is in violation of the Federal Vacancies Reform Act by allowing nonconfirmed officials to lead agencies for extended periods. "There's been a complete abdication by the Trump administration for their duty to seek advice and consent from the Senate," said Ryan Shannon, a staff attorney at the Center for Biological Diversity. Under the FVRA, temporary or acting officials are limited to a term of 210 days, with an additional 90 days allowed during presidential transitions. The Interior Department has previously rejected questions over the legitimacy of those temporary assignments, arguing that none of the individuals has been granted the formal title of acting director and instead merely act "with the authority of directors" (Greenwire, Feb. 12, 2018). Among the officials acting with authority — if not an actual title — is Interior senior adviser Susan Combs, who is handling the duties of assistant secretary for policy, management and budget as she awaits consideration to a long-delayed nomination for that job. Others include Principal Deputy Assistant Secretary for Water and Science Andrea Travnicek, who is acting assistant secretary for fish and wildlife and parks; BLM is being led by Deputy Director of Policy and Programs Brian Steed; and NPS is temporarily helmed by Deputy Director P. Daniel Smith. FWS is likely led by Principal Deputy Director Margaret Everson; OSMRE is headed by Deputy Director Glenda Owens; and Principal Deputy Special Trustee Jerold Gidner is filling the role of special trustee for American Indians. Trump did put forth David Vela to be NPS director and Aurelia Skipwith to head FWS, but those nominations — along with Combs' — still need to be resubmitted for the 116th Congress' consideration. In addition to those vacant posts, Trump has not managed to put forth a successful nominee for Interior's top legal spot during his tenure. While he nominated Idaho attorney Ryan Nelson for solicitor, Nelson withdrew his name in favor of an appointment to the 9th U.S. Circuit Court of Appeals (Greenwire, May 10, 2018). Instead, that job has fallen to Principal Deputy Solicitor Daniel Jorjani — and his long temporary tenure of 247 days and counting has raised concerns among public lands groups. "These appointees come up to be vetted, to show the public what their backgrounds are and what their values are," said Western Values Project Deputy Director Jayson O'Neill. "When you can just issue a memo and extend an acting role beyond what the Vacancy Act says and not even have a nominee, it sure seems like at the very least it's violating the spirit of the law." Trump himself said Sunday that he is in "no hurry" to replace acting heads of agencies, including Interior. "My actings are doing really great. David is doing great at Interior," Trump said according to a White House transcript. "I sort of like acting. It gives me more flexibility. Do you understand that? I like acting. So we have a few that are acting. We have a great, great Cabinet. If you look at my Cabinet, we have a fantastic Cabinet. Really good." But that "really good" Cabinet, particularly at Interior, could create legal challenges to the Trump administration's actions. Jeff Ruch, executive director of Public Employees for Environmental Responsibility, said potential challenges could rely on the fact that "noncompliant officials' actions have no force or effect" — easing the way for lawsuits targeting Freedom of Information Act revisions at the agency, for example, or changes to endangered species regulations. "The title doesn't matter if they're exercising the authority of the office. And I think what this ultimately means, unless this pattern changes, a good amount of what's been done in the Department of the Interior under Trump risks being nullified, which wouldn't necessarily bother us at all," Ruch said.